Welcome to Boulder Junction Charcoal Grill! Refresh your senses and experience the most unique Charcoal Grill in the greater Milwaukee area! Voted one of the top Milwaukee Steakhouse and Milwaukee Burger Restaurants! Boulder Junction burgers are 100% Fresh USDA Black Angus Ground Chuck, delivered fresh daily, never frozen, cooked to perfection! All burgers are served with pickle and steak fries. Lettuce & tomato and onion available upon request. 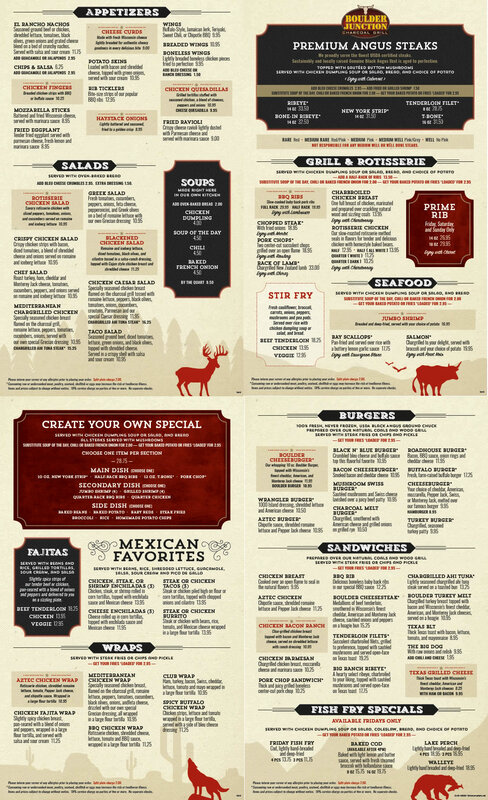 CLICK HERE for a downloadable version of the menu!